Beautifully done - wonderful perspective! Marvelous image...love the comp, the leading lines and the superb reflections of the sunrise!!! Beautiful colors and very well composed! Great image. Any chance I can purchase a digital version for my own personal use? This is fantastic, the light, the composition. Excellent composition, lighting and processing. This tugs at the heart but so captures many things. Beautiful image. Angela, this picture is so beautiful, and the shot must have been taken very near where a high school classmate is listed. 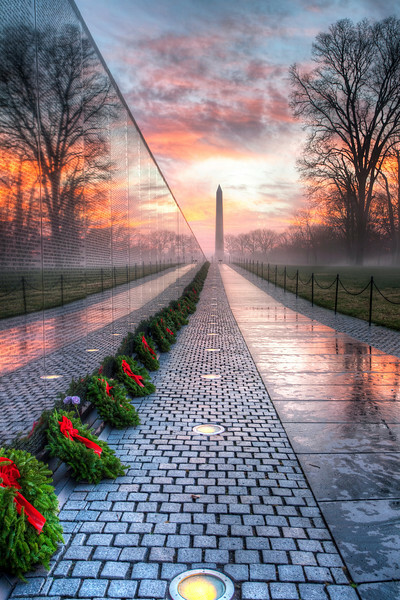 It is a blessing that you can see beauty in this staggering memorial. Thank you.